Parallels Plesk Panel is a complete web hosting automation solution that makes it easy for small businesses to create, customize, and manage websites through an intuitive user interface. Business customers use Parallels Plesk Panel to create a hassle-free point-and-click web presence and to manage company email accounts. Plesk Panel’s offering for service providers makes managing server space and their own hosting customers easier. “Plesk Panel is designed for people who want to run web servers but who are not necessarily experienced systems administrators,” says Blake Tyra, Plesk Panel Product Manager. Parallels Plesk Panel gives users the ability to integrate their websites with sites such as Twitter and Facebook. But Plesk Panel doesn’t stop at these popular social services. In fact, Parallels offers customers an extensive selection of paid and open source apps through the Storefront included in Plesk Panel. Plesk Panel users can choose from over 100 applications to install onto their websites. Simplicity is key for Parallels as a company, too. OEM licensing for ActivePerl and ActivePython makes the distribution of Parallels Plesk Panel hassle- and worry-free. 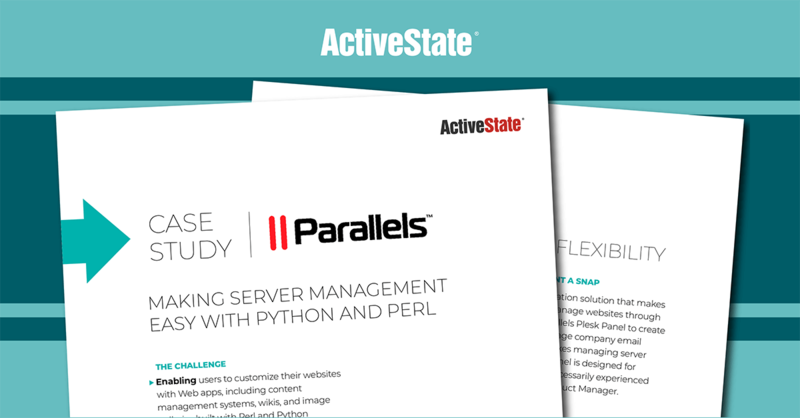 OEM licensing from ActiveState is a turn-key, fail-safe re-distribution licensing, commercial support and indemnification offering for businesses that—like Parallels—bundle ActivePerl and ActivePython with their products. That means Parallels can distribute Plesk Panel in full confidence knowing that ActivePerl and ActivePython open source licensing is in place, accurate, and will not result in legal issues. With ActiveState OEM distributions, there’s no need to waste time, effort and money managing open source licenses. ActivePerl and ActivePython complete every Parallels shipment of the Plesk Platform. They contribute to hassle-free installation and customization, and ultimately, happy customers with more time to spend running their businesses.